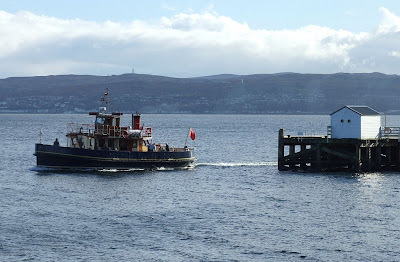 Now in her seventy-first year, Clyde Marine Services' KENILWORTH has spent most of the summer operating their Greenock-Helensburgh-Blairmore service. Displaced from the Gourock-Kilcreggan-Helensburgh ferry service in the spring, this little ship has been given a major refurbishment which included returning the wooden wheelhouse to a natural varnished condition. Looking very smart, and complete with the yellow band at the lower edge of her bulwarks, KENILWORTH is seen this afternoon departing from Blairmore on her non-landing afternoon cruise to Carrick Castle.